Since we are in the midst of a period of special transit schedules due to the holidays, I’ve been paying particular attention to the signs posted in bus shelters, etc. 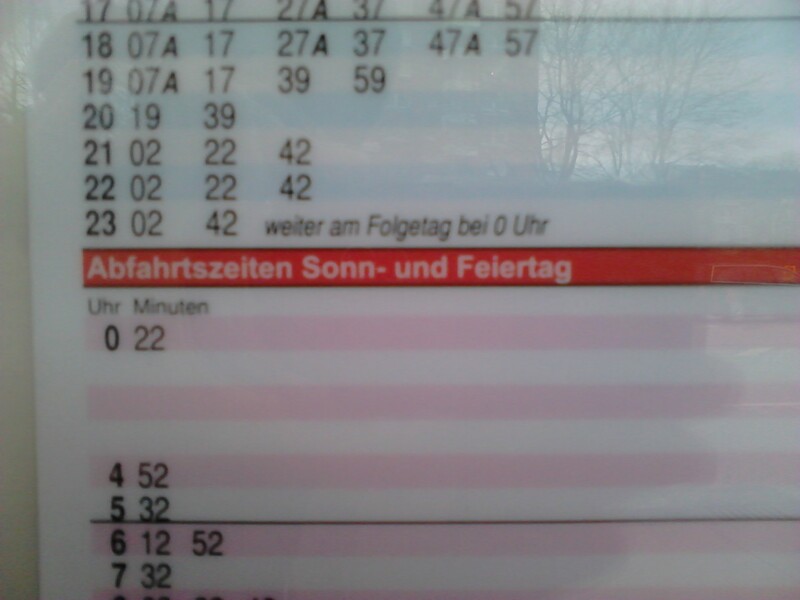 What I had failed to notice previously is that the times for Sundays and holidays are listed under the heading Sonn- und Feiertag. Two things struck me immediately. First, I don’t recall ever seeing a schedule where Sunday, or any other day for that matter, was listed as “Sun-” if it was followed by “and” and the name of another day. I also don’t think that English speakers are very aware of the “Sunday-Holiday” connection via both including the word “day.” Second, and I’m only going by memory, but I’d expect North American bus schedules to read “Sundays and Holidays” rather than “Sunday and Holiday” which would be the literal translation of the German used on the sign in the picture above. Yesterday I was discussing how to form the plural of das Kaninchen – “rabbit.” This discussion began because this word, and a picture of a rabbit, appears on the cover of the Pixi book Unsere Tiere: Ein Bestimmungsbuch – Our Animals: A Field (Classification) Guide – and unfortunately for German learners, the cover is the only place where the definite article appears. (This seems a bit ironic given the book’s title includes a compound with die Bestimmung, a word from the same family as the adjective bestimmt, since the “definite article” is a bestimmter Artikel.) Bob joked that we would simply have to use the definite plural – die – all the time which got us wondering how the plural for –chen words was formed. A quick check with dict.cc showed that several sample –chen words (that we’d been discussing on another day because of their pronunciations) – das Stäbchen and das Mädchen (“chopstick” and “girl”) – had null plurals. Immediately, a new hypothesis came to mind, perhaps both of the major diminutive forms –chen and –lein – have null plurals? I investigated this with das Buchlein and das Fräulein (“booklet” and “unmarried woman”) and it appeared to hold true. A quick search today led me to this page on the German for English Speakers site. It shared two facts that I already knew about the two big German diminutives (pun intended): they take das as a definite article and they often trigger an umlaut during conversion. It also confirmed the new idea that their singular and plural forms are identical. I have to say I love a rule that tells you to do absolutely nothing to signal a grammatical change, such rules seem rather few and far between in German! Here in Hamburg we’ve just celebrated Heilige Abend and Weihnachten – three days of festivities in all. Take apart that latter word, which we could translate as “Christmas,” and you get weih and nachten. The first part comes from the verb weihen which means “to consecrate” as in to make something holy or when used about a person a better translation would be “to ordain.” The second portion comes out of Middle High German where the plural for die Nacht – “night” – was not die Nächte as it is today but nahten. I find it intriguing how in English the holiday on the 24th is associated with evening – “Christmas Eve”- but typically we refer to the 25th as “Christmas Day” rather than “*Christmas Night.” Moreover, only one day is referred to – it isn’t “*Christmas Days.” If the 26th is a celebration, it is called “Boxing Day” (for more on that, see this Wikipedia entry). Today’s creatively confused mishearing was Kupfer /ˈkʊpfɐ/ “copper” instead of Köpfe /ˈkœpfə/ “heads.” The former made no sense in the context but (a) I’d heard and said it before and (b) it is an interesting word as it moved away from its Latin roots – cuprum- with German spelling reform. Such are some days in the life of a German learner and for Hamburg dwellers in particular,with the omnipresent harbor, the concept of not being able to see land seems particularly apt to describe the feeling one often has in trying to master the language!